Home Life of Buddhist Slider Do you make big asravas (difilements) from small ants? 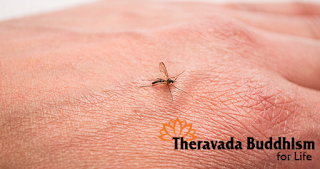 People in the society make lots of asravas with their weakness of passing by the bothering of insects like mosquitoes, flies, cockroaches, etc. They make new asravas and improve existing asravas. Therefore be clever to by-pass those dangers using a defense system. Use a net if there are mosquitoes. Use a suitable harmless repellent for ants. While increase the bothering of insects people get anger and minds will unstable. Some people kill mosquitoes biting them even in the time of participating for Dharma sermons. Some people killing insects using chemicals such as insecticides. They do that heavily in the field of agriculture because of the covetousness of increasing the crop. They collect lots of asravas from those activities. Just because of the inability of seeing figure as the tempter, unclever of passing by the thoughts which have to by-pass, they make lots of asravas according to killing and hurting of animal. Do not ever think that sins of killing small animals such as ants and mosquitoes are small too. By-pass that mind thinking it is a mind of tempter. Think that you kill those insects regularly, and if you memorize such a mind in the moment of death you might rebirth as an insect or in a human with lots of diseases. If that person weak in virtue he might be born in hell. In the present human create chemical weapons because of the hungry of power. They kill people and animals using those weapons. It is like killing insects using insecticides. The people who kill pests using pesticides, will subject to a death from chemicals such as chemical weapon attack, death from poisonous gases, etc in the future or future lives. Just like killing insects in large number in present, in the future human will subject to death from chemical poisoning, gas poisoning. Present world is talking about environmental pollution and people subject to ill due to the poisonous gases in the air. All those are results of sins of human.